Lehi, Nephi, and Jacob utilizing the plates. Image via Book of Mormon Central. The prophet Nephi made two separate records, and called them both “the plates of Nephi” (1 Nephi 9:2). One set of plates was for “a full account of the history” of Nephi’s people (1 Nephi 9:2), and the other was “the ministry and the prophecies” had among the people (1 Nephi 19:3). When Nephi was about to pass away, he placed the record focused on the ministry into the hands of his younger brother, Jacob, whom he had earlier appointed as a priest and teacher (2 Nephi 5:26). Jacob is the one who designated the two sets as the “small plates” and the “the larger plates” (Jacob 1:1; 3:13). But then, speaking of the small plates commissioned to him, he says, “These plates are called the plates of Jacob, and they were made by the hand of Nephi” (Jacob 3:14). So, Jacob seems to rename the plates Nephi made and named when he starts writing on them. The Book of Mormon text never mentions Lehi making any plates. S. Kent Brown, former professor of ancient scripture at BYU, argued that Lehi’s record was a diary-like account kept on perishable materials.2 Nephi says that he “did engraven the record of [his] father” onto his own plates (1 Nephi 19:1). 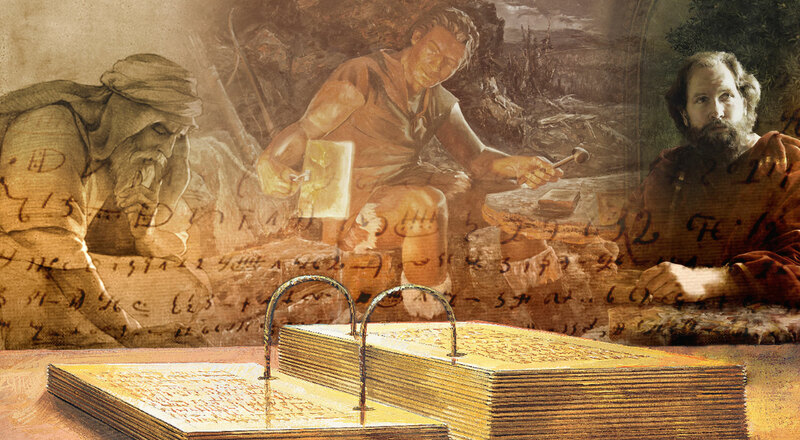 This portion of the large plates could reasonably be called both “the account of Nephi” (because Nephi made the plates and diligently engraved them) and also “the plates of Lehi” (because Lehi was the ultimate author of that part of the underlying record). The Book of Mormon consists of a complex set of different records, accounts, and plates. Diligent study is needed to fully understand and appreciate the relationship of all these different chronicles. There is something to be learned from every statement. When detailed study is done, impressive consistency emerges in how these records are identified and labeled. There may also be practical reasons why Jacob felt it was appropriate to call these plates “the plates of Jacob.” First, it would distinguish them from the other plates of Nephi, which were being passed along through the royal lineage. Second, as English scholar John S. Tanner pointed out, “After passing into Jacob’s hands, the small plates became increasingly focused on the history of Jacob’s family rather than on the history of the whole Nephite group.”4 Indeed, Nephi had instructed Jacob to “preserve these plates and hand them down unto [his own] seed, from generation to generation” (Jacob 1:3). He probably had reason to expect that these plates were going to be more about the history of his own lineage and, therefore, felt titling them as the “plates of Jacob” was more appropriate for this set of records. Meanwhile, with the large plates taking on a broader scope as a history of the people as a whole, kept by the kings, naming the plates after the founding patriarch and calling them “the plates of Lehi” would also have been appropriate. Possessing a record named after Lehi, the first leader of the Lehite community, would have added to the legitimacy of the Nephite line as the proper successor of Lehi’s authority and legacy. Together, this shows that patient reflection and further study often resolves apparent discrepancies, like the one mentioned here, not only with answers but insights. There are reasons for renaming at least parts of both of the original “plates of Nephi” that make sense in light of the practical circumstances of the writers as well as in the different purposes to which those plates were dedicated. John L. Sorenson, “Mormon’s Miraculous Book,” Ensign (February 2016): 38–41. John L. Sorenson, “Mormon’s Sources,” Journal of Book of Mormon and Other Restoration Scripture 20, no. 2 (2011): 2–15. David E. Sloan, “Notes and Communications—The Book of Lehi and the Plates of Lehi,” Journal of Book of Mormon Studies 6, no. 2 (1997): 269–272; reprinted in Pressing Forward with the Book of Mormon: The FARMS Updates of the 1990s, ed. John W. Welch and Melvin J. Thorne (Provo, UT: FARMS, 1999): 59–62. S. Kent Brown, “Nephi’s Use of Lehi’s Record,” in Rediscovering the Book of Mormon: Insights You May Have Missed Before, ed. John L. Sorenson and Melvin J. Thorne (Salt Lake City and Provo, UT: Deseret Book and FARMS, 1991), 3–14. 1. Joseph Smith, preface, The Book of Mormon: An Account Written by the Hand of Mormon, Upon Plates Taken from the Plates of Nephi (Palmyra, NY: E. B. Grandin, 1830). 2. S. Kent Brown, “Nephi’s Use of Lehi’s Record,” in Rediscovering the Book of Mormon: Insights You May Have Missed Before, ed. John L. Sorenson and Melvin J. Thorne (Salt Lake City and Provo, UT: Deseret Book and FARMS, 1991), 4–5; also see John L. Sorenson, “Mormon’s Sources,” Journal of Book of Mormon and Other Restoration Scripture 20, no. 2 (2011): 5. 3. David E. Sloan, “Notes and Communications—The Book of Lehi and the Plates of Lehi,” Journal of Book of Mormon Studies 6, no. 2 (1997): 270–271. 4. John S. Tanner, “Jacob and his Descendants as Authors,” in Rediscovering the Book of Mormon, 55.